Penaudio are a small company hailing from Finland. They have a range of interesting speakers running up to serious floorstanders, but for this test I have a pair of their Rebel sub-compact speakers. Sub-compact or mini monitors, neither really conveys how tiny these little beauties are. With the main driver cone just 8 cms across and the tweeter faceplate not a lot smaller, packed into a baffle just big enough to take them these are speakers that make classics like the AE-1 look overweight. They're pretty deep though (120 x 230 x 245 in mm) and a carcass of 16 mm MDF makes them heavier than you expect - 4.2 kgs. They'll also handle 80 w continuous so we're looking at a minuature with real hi-fi pretentions. 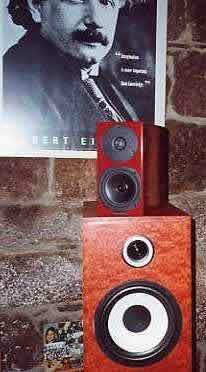 The finish of the review pair was a 'Basque red' two-pack gloss, which gave the impression they were carved from a single piece of polished bakerlight. Certainly they looked the biz, glossy, solid and expensive. Dropping the Penaudio's out of their packaging was very satisfying, small jewel-like hi-fi components always have a certain appeal, but beyond that what is the point? I'm going to generalise here, but all things being equal a big speaker will have better bass extension, loudness capabilities, dynamics and efficiency than a small speaker. i.e. a good big'un will always beat a good little'un. But things aren't quite that simple. Within a given budget a small box will be cheaper and this allow for better drivers, for many the starting point of a good speaker. Secondly big flat areas of wood will 'sing-along' with the drivers so colouring the sound, especially at lower price points where big boxes tend to be unbraced and thin, small boxes avoid this. The baffle is particularly important as it will vibrate along with the drivers adding considerably to the sound, speakers like the Rebel don't have enough baffle to worry about. This lack of colouration, and two small drivers packed tight together tend to give small speakers a lead in imaging. Look at high-end, large speakers and you'll find they're built like tanks - and so are very expensive... Because of the lack of air volume and wood, small speakers lack inertia and so stop and start faster than big speakers. Lastly small speakers take up much less space than some of the hulking monsters the high-end demands, though here the Penaudio's rear firing port and audiophile pretensions need a decent stand and space behind them, in effect taking up as much room as a small floorstander. There are two ways to design a small speaker. Either you use a long throw driver and tune the port around 80 hz to give the illusion of real bass so that the speaker sounds more like a floorstander, or you accept that what you have is a small speaker and try to make the most of the advantages small size offers. Penaudio have opted for the latter and IMHO wisely so I think. 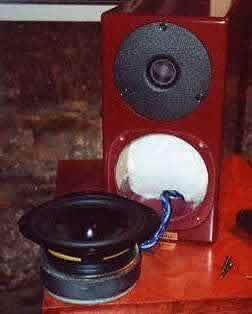 Small speakers can be made to sound big, my own 11 ltr Morel driven ported boxes (much bigger than the Rebels) are like this, but the trick is done with a very expensive woofer and poor efficiency. And you have to ask yourself 'what is the point?' Better to build a bigger speaker in the first place. It has to be said that the Penaudio's always sounded 'small'. Imagine very, very high quality computer speakers and you'll have at least an idea of what I mean. Measured results in my 6*7 m listening room were pretty poor but interesting... I was shocked to find that I got measurable output at 25 Hz but listening to it showed it to be a very noisy port rather than a 'note'. Once this was discounted nothing really happens until the expected port induced (?) hump peaking at about 80 hz followed by a trough which doesn't recover until 200 Hz. After this the midrange is OK if a little uneven and treble over 3kHz is extended - rather more than normal. As I said before most small speakers have a port induced hump around 80 hz, but then most of them are at least twice the size of the Rebel and so their larger drivers can take over to fill in above this level. In the Penaudio's case the driver just can't shift enough air. To add to the problem the port is as long as physically possible given the depth of the box, and in fact is hard up against the tweeter magnet so constricting the opening, the source of the 'wind noise' at 25 Hz. For my own part I'd have preferred to see a shorter port tuned to - say - 110 Hz and then just forget the low bass as a lost cause. The result would have been a much more even bass response and a better match for those wanting to use a sub. I'd also be tempted to make it a front firing port so that the speaker could run closer to a rear wall, after all space saving is one of the main advantages of a small speaker and one which the Penaudio cannot exploit at present. However these comments only apply in a largish room. But Penaudio don't take much notice of measured response, preferring their ears and in fact despite the above flaws the speaker does have some very positive attributes especially in the environment it's designed for. I mentioned that the Rebel had not been tuned to sound like a big speaker, and this has a few major advantages. Firstly a full-range speaker, no matter how good, will sound hopelessly overblown in a small room. Room resonances will make it sound slow and boomy. In a small room the Rebel's 'small' sound fills out and sound much more balanced. However in the main listening room things were not too happy. At the same time the imaging is excellent, especially stage depth, which with the Korato's went way behind the back wall. Then I set them up in my office. This is 3*4 m - the size of a lot of listening rooms I suspect. Here the situation changed completely. With the Roksan Caspian and the Loth-x 300b amp they suddenly found their 'raison d'etre'. The small room made the Loth's 8 watts (helped by the high impedence) adequate for background listening, but suddenly the Rebels meshed with the room's resonances to produce a much warmer, detailed and really 'nice' sound - rooms of this size being 'lively' in the 100-200 hz region so filling in the Rebels mid bass. Aretha Franklins voice took on the body it lacked in my lounge, and her stunning timing was well to the fore. I've always said that the room was the single most critical component and here was conclusive evidence. And of course that is exactly as it should be. If you've a large room buy big speakers, small one's will be 'lost', similarly in a small room the tonal balance of a floorstander will be disastrous. (Disclaimer - there are always exceptions...). The Rebel is designed for a very small room and in such a room is as good as it is bad in a big one. Here in Finland it sometimes feels that reviewers rather point out errors than use their time to find out true potential of a component under review. Rebels were reviewed in finish HIFI magazine in test with eight other stand speakers of same price group. Rebels were blamed of thin sound. I have visited their listening room and I know what kind of a bunker it is. I am certain that Rebels would have sound as you described they sounded in your office, if they had been sited properly. But they didn't "waste" their time in such nonsense and published the review, which was like your description of Rebel in big room. One of the listeners of test team visited twice our exhibition room in HIFI exhibition last autumn and was very surprised of Rebels bass reproduction. He even asked where we had hide sub. In test few months after exhibition he blamed Rebels bass as thin. They also don't let manufacturer or importer to read and comment tests first so we didn't had possibility to explain the lack of bass. Well they still have something to learn. Thank you Geoff for pointing out importance of good room-speaker match. This is something one should always keep in mind whenever choosing speakers. Especially in small rooms built out of hard material, will room resonance affect speker´s sound very much. For an example if one chooses speakers for small room and does test listening in bigger room, there might be a surprise waiting in the shadows of room resonance. Bass might cause problems as Geoff mentioned in the article. Rooms smaller than 4m x 4m could be considered as small. Rebel Evo I is tuned to 52 Hz. It is tuned to that frequency because so it will produce "deep" bass in small rooms. So we are not trying to make Rebels to sound bigger than they are. Tuned to 52Hz the Rebel bass, that is produced, is clean and tight, neutral. It is true that frequency starts to drop down slowly from 200 Hz. But because it is designed to work in a quite small rooms so the rooms will compensate its bass. The frequency up to 3kHz is extended. But because we use textile dome tweeters it has no problem to do that. The extension produces more air to sound of violin, piano, drums and human voice with real echo. But it can also be a problem if you use poor amplifier or compressed recordings. preamp: Audion Premier2, Korato KVP 10.
power amp: Audion ETPP EL34 Monoblocks. Korato KTA 100.